The TA-600MULTI is a perfect solution for residential as well as commercial installations in restaurants, pubs, shops, conferencing rooms, fitness clubs for both background music and voice playback systems. A single TA-600MULTI amplifier allows to build cost-effective multi-room audio installation and play different music in each of 4 zones (from 3 inputs) with independent volume and sound control for each, and to broadcast voice messages to selected zones simultaneously. High and constant power is delivered by an oversized, audiophile grade 200W toroidal transformer. The TA-600MULTI integrated amplifier offers the finest music performance at this price level and perfect matching with most speakers available in the market. A variety of features and wired connections makes the TA-600MULTI a very versatile device with ability to work in different applications. Multi-room sound. 4-zone, high-power stereo amplifier able to drive four pairs of speakers (from 4 to 16ohms) – a cost-efficient and easy way to deliver sound to many rooms. 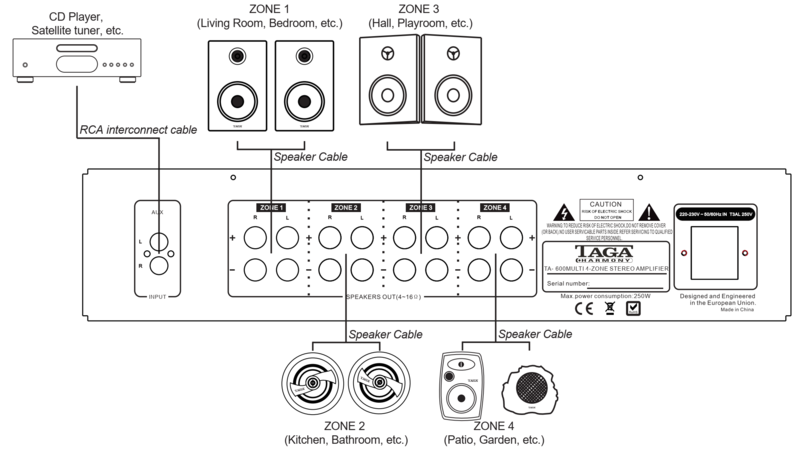 Each zone with independent: source audio input selection (out of 3 onboard), volume and sound (treble / bass) regulations to play individual music at different volume levels in separate rooms. Built-in microphone input with a mixing and echo control - is a perfect solution for voice broadcasting to the selected zones. USB input to quickly and easily play music from USB flash driver (supports MP3 / WMA / WAV / APE files) for almost endless playback. RCA stereo input at the rear to hook additional equipment like a CD player, radio tuner or other analog devices. Force-air cooling is specifically designed for long working time. Pairs of 4 to 16ohm speakers can be used in each zone. Weight 6.6 kg / pc.